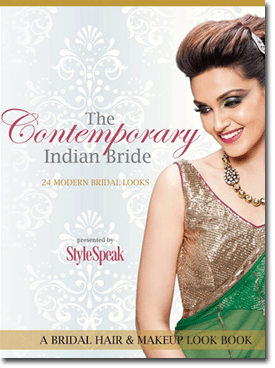 ‘The Contemporary Indian Bride’ is StyleSpeak‘s endeavour to provide inspiration and ideas in BRIDAL hair and make-up to salon professionals. Collaborating with 12 of India’s most renowned and respected make-up artists and hairstylists like Asha Hariharan, Virginia Holmes and Renee Melek, the look book contains 24 exquisite looks for the young, modern bride. The 12 different hair looks with 12 corresponding make-up looks offer options for light as well as elaborate make-up, which can be used all year round for various festive occasions. Apart from being a source of inspiration, ‘The Contemporary Indian Bride’ is also an instructional product as it comes with an exclusive Step-by-Step booklet (in English & Hindi). This booklet describes in detail all 24 of the looks featured in the look-book and allows professionals to re-create the look perfectly. Containing a variety of colour options ranging from coral and peaches to green and blues; ‘The Contemporary Indian Bride’ has something for everyone. Alongwith serving as a guide book for the stylists, it also makes for an excellent reference book for the client to select the kind of hair and make-up she wishes to have on her big day!